Invite boho vibes with vivid colors with the Intelligent Design Layne Coverlet Set. This ultra-soft microfiber coverlet flaunts a large damask design that is broken up by an oversized chevron motif. Floral accents in gorgeous teal hues soften the look and give it a boho feel. A dark teal reverse complements the elegant print on the top of bed, while matching sham(s) create a chic coordinated look. Two decorative pillows, one with an intricately embroidery elephant and one with fabric manipulation, provides the perfect finishing touch. Machine washable for easy care, this coverlet set will easily transform your bedroom into the perfect abode. 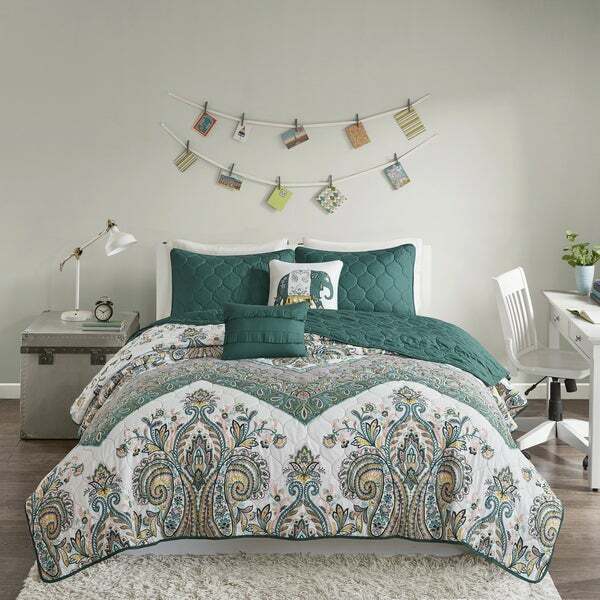 We picked this comforter set out for my daughter's college room. She is very picky and shopped around for something that was this style and would match her decor. She couldn't be happier with the quality and look of the set. The decorative pillows that come with the set add to the look. Really love the color and design. Unfortunately lots of lose threads in the pillows and comforter. The comforter itself is thin and would be best for summer. Bought this for my teenage daughter and she absolutely loves it! The colors are true to the photos. It's good quality with no visible loose threads. It's comfortably and surprisingly warm without being heavy. It's cute. Okay for the price, but I think it's meant more for a teenager's room. It was a decent value and is nice and lightweight which works well here in Florida.